Do you have a short life line? 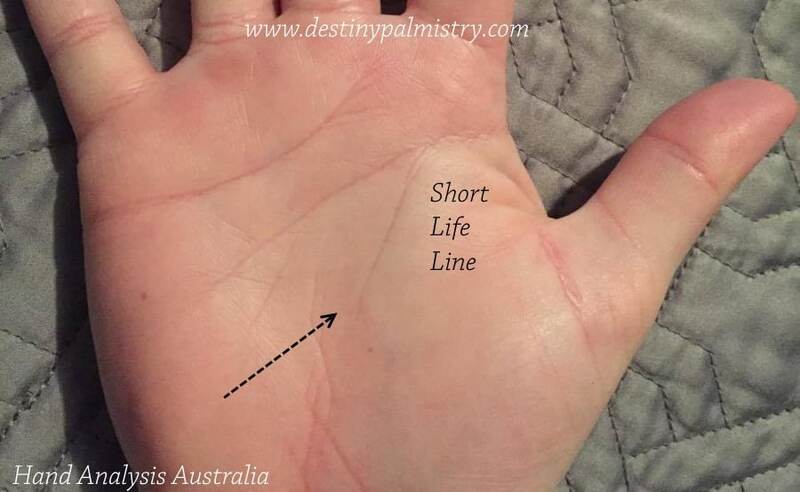 The short life line in palmistry is very interesting indeed. The life line itself is the most talked about line on the hand. (Read below). Today I want to continue to discuss the short life line and other interesting features it can have. The reason why it is an interesting line is that it is the first line a person typically looks at on the palm. This line is also frequently the most prominent line on the palm as it arcs around the mount of Venus (the thumb ball), reaching somewhere near the wrist. Examining this line is essential in obtaining confirmation and timing of events because through the markings along the line, there is a capacity for seeing considerable changes. The line can grow, alter, shift or even fade as circumstances transform over time. However, all indicators from the palm should be considered before making assumptions, as some factors offset (or support) the findings. Read the article about timing on the life line here. To judge how a person manages their world; we observe the quality of the line. Ideally, it is well-defined without deviations or markings. In the present day, however, that is not likely to occur due to busy and demanding lives. The start of the life line does not always commence at the same position, occasionally starting close to the thumb and other times as high as the Mount of Jupiter. If it sits high, it shows an ambitious and confident nature. Occasionally it can begin joined with the head line and appear like a branch from it, which means a much more insecure yet family orientated spirit. These types show a good deal less confidence compared to those with a separate line from the head line. The closer it is to the thumb, the less energy and enthusiasm there is for life. The thing I would like to mention is that a short life line does not mean a short life. The length and prominence of the line refer to the quality of life, the Constitution, family roots, security and the get-up-and-go of the individual. Some life lines curve around enough to reach out towards the mount of Moon (lower ulnar side of palm) so far as to touch the fate line. I have learned that when this occurs, it has a significant meaning around that period indicating a need for change or an event which brings about change, often career or motivations become a current focus. A line which arches widely towards the mount of Moon depicts an outgoing person with many interests, a love of travel and changes of scenery. A broad line curving well around the Venus mount shows warmth and affection but a little more reserved. A line close to the thumb shows a lack of energy and love; a person who is entirely selfish or cold emotionally, especially if the Venus mount is flat. (Click here to download the eBook now). The author and publisher disclaim any liability or responsibility to any person or entity on any outcome; loss or damage caused directly or indirectly by the utilisation of any information presented on this website. The contents of this material reflect the author’s views in the field of palmistry and hand analysis. Please seek the services of a professional if legal or qualified advice or assistance is required. The purpose of this website is to provide informative material and to entertain.